The Chancellor of Middlesex University, Dame Janet Ritterman, has been awarded one of the highest honours in Austria for her significant contribution to science and the arts. Frank Sinatra received the same honour in 1984. 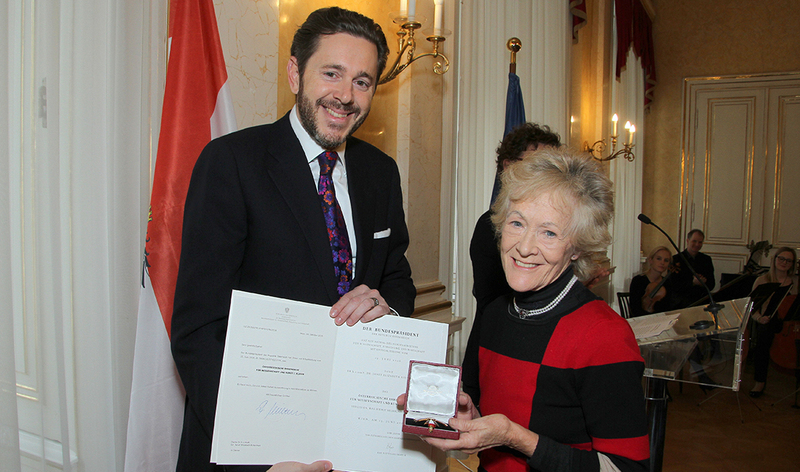 An eminent pianist, accompanist and academic, Dame Janet received the “Ehrenkreuz für Wissenschaft und Kunst 1 Klasse” (Austrian Cross for Science and Art, 1st Class) at a ceremony in Vienna on 15 November. The award was presented by Austria’s State Secretary for Science, Research and Economy, Dr Harald Mahrer. “I am delighted to have been honoured in this way by the Austrian arts and science community,” said Dame Janet. The nomination for the award was made by Professor Dr Georg Schulz, MSc, former head of the University of the Arts, Graz, who recognised Dame Janet’s contribution to the arts at universities in Austria as a founding member of the Austrian Science Council and her ongoing role at the Austrian Science Fund. Only 50 people in Austria or abroad have received this honour in 2016. Dame Janet lives in Newton Abbot, Devon, and is a former Director of the Royal College of Music London and Principal of Dartington College of Arts. She was appointed Chancellor of Middlesex University in 2013. She is also a Strategic Development Adviser for the Orpheus Institute in Ghent, Belgium and a founder member of the Conseil de Fondation for the Haute École de Musique in Geneva.